Conditional Formatting is one of the most simple yet powerful features in Excel Spreadsheets. As the name suggests, you can use conditional formatting in Excel when you want to highlight cells that meet a specified condition. It gives you the ability to quickly add a visual analysis layer over your data set. You can create heat maps, show increasing/decreasing icons, Harvey bubbles, and a lot more using conditional formatting in Excel. 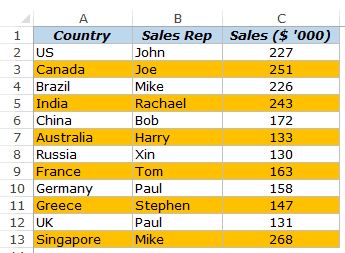 Quickly Identify Duplicates using Conditional Formatting in Excel. Highlight Cells with Value Greater/Less than a Number in a Dataset. Highlighting Top/Bottom 10 (or 10%) values in a Dataset. Highlighting Errors/Blanks using Conditional Formatting in Excel. Creating Heat Maps using Conditional Formatting in Excel. Highlight Every Nth Row/Column using Conditional Formatting. 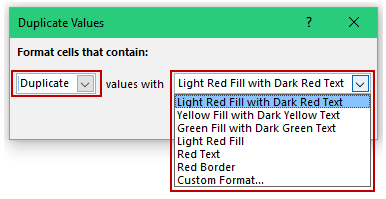 Search and Highlight using Conditional Formatting in Excel. 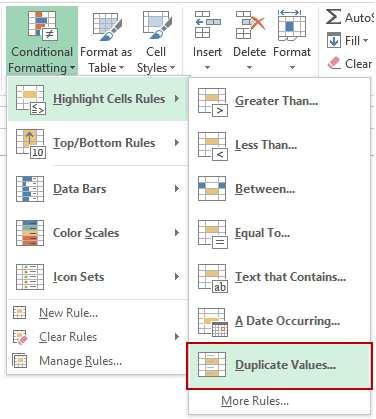 Conditional formatting in Excel can be used to identify duplicates in a dataset. Select the dataset in which you want to highlight duplicates. 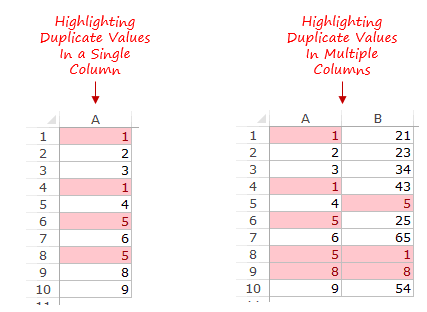 Go to Home –> Conditional Formatting –> Highlighting Cell Rules –> Duplicate Values. In the Duplicate Values dialogue box, make sure Duplicate is selected in the left drop down. You can specify the format to be applied by using the right drop down. There are some existing formats that you can use, or specify your own format using the Custom Format option. This would instantly highlight all the cells that have a duplicate in the selected data set. Your dataset can be in a single column, multiple columns, or in a non-contiguous range of cells. You can use conditional formatting in Excel to quickly highlight cells that contain values greater/less than a specified value. For example, highlighting all cells with sales value less than 100 million, or highlighting cells with marks less than the passing threshold. 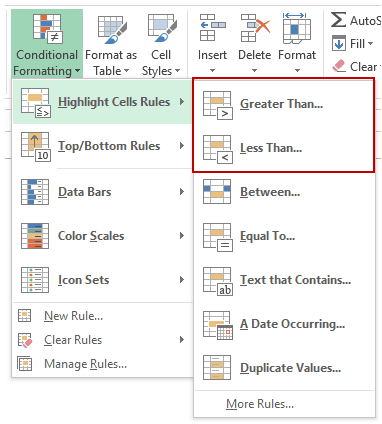 Go to Home –> Conditional Formatting –> Highlighting Cell Rules –> Greater Than.. / Less Than..
Based on what option you select (greater than or less than), a dialogue box would open. Let’s say, you select the ‘Greater than’ option. In the dialogue box, enter the number in the field on the left. The intent is to highlight cells that have a number greater than this specified number. Specify the format to be applied to the cells that meet the condition by using the drop-down on the right. There are some existing formats that you can use, or specify your own format using the Custom Format option. This would instantly highlight all the cells with values greater than 5 in a dataset. Note: If you wish to highlight values greater than equal to 5, you should apply conditional formatting again with the criteria “Equal To”. The same process can be followed to highlight cells with a value less than a specified values. 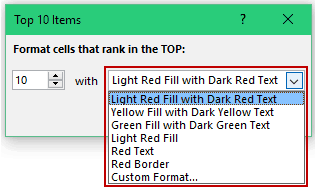 Conditional formatting in Excel can quickly identify top 10 items or top 10% from a data set. This could be helpful in situations where you want to quickly see the top candidates by scores or top deal values in the sales data. Similarly, you can also quickly identify the bottom 10 items or bottom 10% in a dataset. 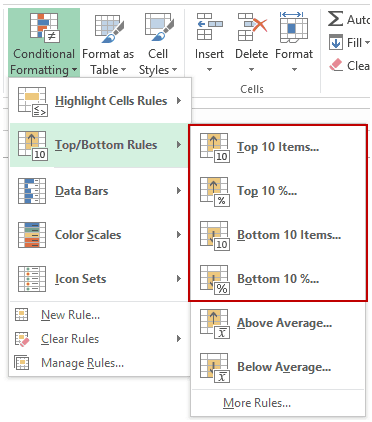 Go to Home –> Conditional Formatting –> Top/Bottom Rules –> Top 10 Items (or %) / Bottom 10 Items (or %). This would instantly highlight the top 10 items in the selected dataset. Note that this works only for cells that have a numeric value in it. 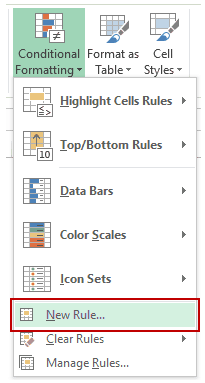 Also, if you have less than 10 cells in the dataset, and you select the options to highlight Top 10 items/Bottom 10 Items, then all the cells would get highlighted. If you work with a lot of numerical data and calculations in Excel, you’d know the importance of identifying and treating cells that have errors or are blank. If these cells are used in further calculations, it could lead to erroneous results. 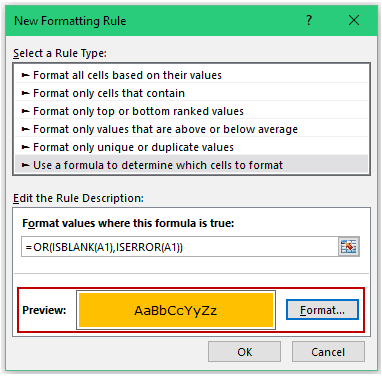 Conditional Formatting in Excel can help you quickly identify and highlight cells that have errors or are blank. This data set has a blank cell (A4) and errors (A5 and A6). Select the dataset in which you want to highlight blank cells and cells with errors. 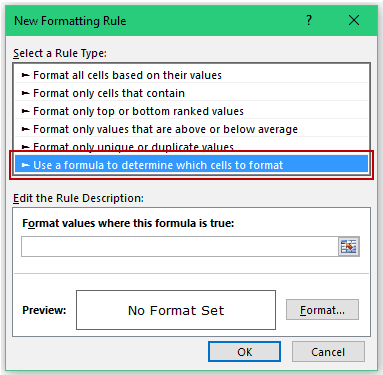 In the New Formatting Rule dialogue box select Use a formula to determine which cells to format. The above formula checks all the cells for two conditions – whether it is blank or not and whether it has an error or not. If any of the conditions is TRUE, it returns TRUE. 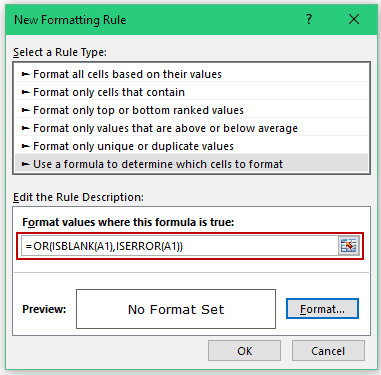 Set the format that you want to apply to the cells that are blank or have errors. To do this, click on the Format button. It will open the ‘Format Cells’ dialogue box, where you can specify the format. This would instantly highlight all the cells that are either blank or have errors in it. See Also: Using IFERROR and ISERROR to handle errors in excel. A heat map is a visual representation of data where the color represents the value in a cell. For example, you can create a heat map where a cell with the highest value is colored green and there is a shift towards red color as the value decreases. The above data set has values between 1 and 100. Cells are highlighted based on the value in it. 100 gets the green color, 1 gets the red color. Here are the steps to create heat maps using conditional formatting in Excel. 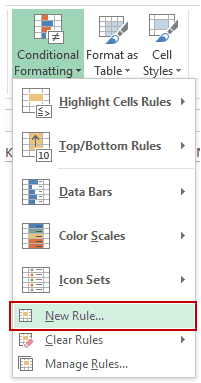 Go to Home –> Conditional Formatting –> Color Scales, and choose one of the color schemes. As soon as you click on the heatmap icon, it would apply the formatting to the dataset. There are multiple color gradients that you can choose from. If you are not satisfied with the existing color options, you can select more rules and specify the color that you want. Note: In a similar way, you can also apply Data Bard and Icon sets. You may want to highlight alternate rows to increase the readability of the data. These are called the zebra lines and could be especially helpful if you are printing the data. Now there are two ways to create these zebra lines. 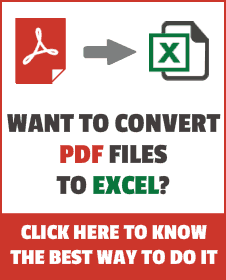 The fastest way is to convert your tabular data into an Excel Table. It automatically applied a color to alternate rows. You can read more about it here. 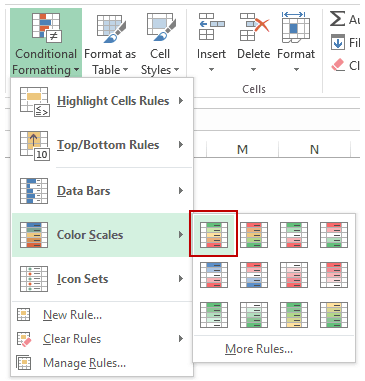 Another way is using conditional formatting. Here are the steps to highlight alternate rows using conditional formatting in Excel. Select the dataset. In the example above, select A2:C13 (which excludes the header). If you want to include the header as well, then select the entire data set. 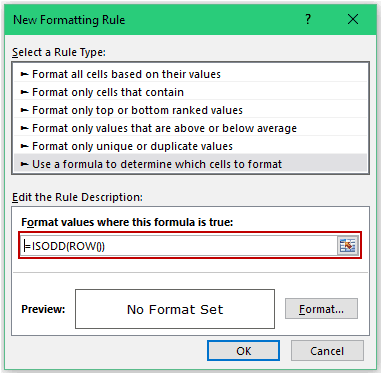 In the dialogue box, select ‘Use a Formula to determine which cells to format’ dialogue box. The above formula checks all the cells and if the ROW number of a cell is odd, then it returns TRUE. The specified conditional format would be applied to all the cell that return TRUE. That’s it! The alternate rows in the data set will get highlighted. This one is a bit advanced use of conditional formatting. It would make you look like an Excel rockstar. Go to Home –> Conditional Formatting -> New Rule (Keyboard Shortcut – Alt + O + D). 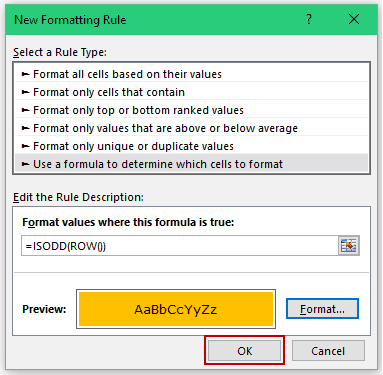 In the New Formatting Rule dialogue box, select the option ‘Use a formula to determine which cells to format’. That’s it! Now when you enter anything in cell C2 and hit enter, it will highlight all the matching cells. The formula used in conditional formatting evaluates all the cells in the dataset. Let’s say you enter Japan in cell C2. Now Excel would evaluate the formula for each cell. Cell C2 is not empty. The content of cell C2 exactly matches the content of the cell in the dataset. Hence, all the cells that contain the text Japan get highlighted. Highlight the entire row instead of a cell. Highlight even when there is a partial match. Highlight the cells/rows as you type (dynamic) [You are going to love this trick :)]. Once applied, conditional formatting remains in place unless you remove it manually. 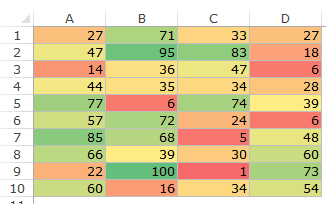 As a best practice, keep the conditional formatting applied only to those cells where you need it. Since it’s volatile, it may lead to a slow Excel workbook. Select the cells from which you want to remove conditional formatting. 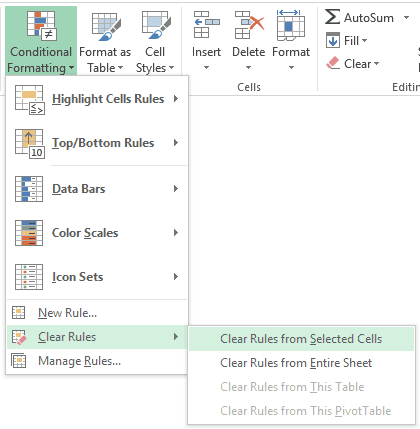 Go to Home –> Conditional Formatting –> Clear Rules –> Clear Rules from Selected Cells. If you want to remove conditional formatting from the entire worksheet, select Clear Rules from Entire Sheet. Conditional formatting in volatile. It can lead to a slow workbook. Use it only when needed. When you copy paste cells that contain conditional formatting, conditional formatting also gets copied. 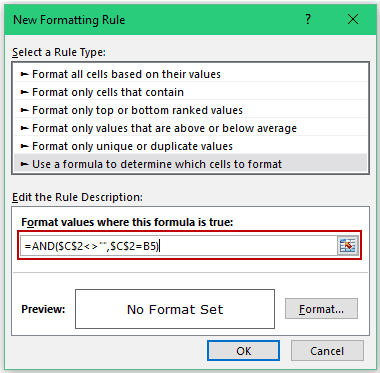 If you apply multiple rules on the same set of cells, all rules remain active. In the case of any overlap, the rule applied last is given preference. You can, however, change the order by changing the order from the Manage Rules dialogue box. 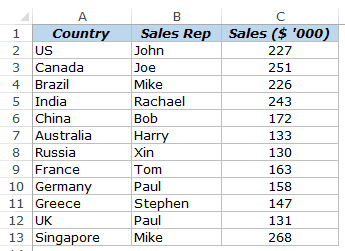 The Right Way to Apply Conditional Formatting in Pivot Table. The Ultimate Guide to Using Conditional Formatting in Google Sheets. Like this i have a search on partial words. The examples are very useful. I want to apply conditional formatting to a range depending on a value within that range. I have several range of that type and want to copy paste that condtional formartting to rest all of the individual ranges. Plss plss help me out. You can copy and paste conditional formatting as well. Just copy the cells which have the conditional formatting and use paste special options to paste format only. Very useful and well explained with examples. Thanks for commenting Mariana.. Nth could be any number. 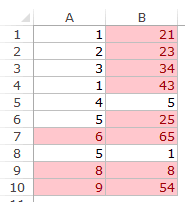 So if you want to highlight every 5th row, you can use the formula =MOD(ROW(),5)=1 in conditional formatting. This is really helpful, I really liked this post. Thank you sir, it is excellent training on excel. Can you send me Gantt chart preparation video.